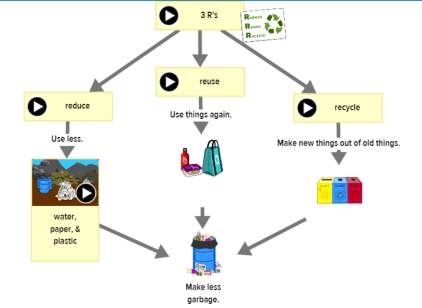 This exemplar map, based on BrainPOP ELL’s Recycling movie, illustrates the content of the movie using the image and keyword banks on the left side of the screen. The student also created new keywords with blank nodes, constructed sentences to label images, and finally connected ideas by labeling the arrows. Ask students to describe their maps to a partner, small group, or the whole class. Or, they can write an explanation or idea by clicking the My Maps button and then Add Notes.